Over each of the past 13 years that I’ve been a Stay At Home Dad there’s been at least one person every year who thinks it’s funny to wish me “Happy Mother’s Day, Mr. Mom”. Here’s the scoop. It’s. Not. Funny. The first few times I heard that I laughed at it, in the same way that I laughed at being called a “Mr. Mom”. More cringing than laughing. Then, after it happened a few times I began to think about why it was insulting to moms and dads for me, a dad, to be wished a “Happy Mother’s Day”. This day celebrates moms. All moms. Those who choose to work at home as full time moms and those who choose to work full time outside of the home. And any combination in between. Retired moms. Expecting moms. You get the picture. Just because I have chosen to work in a role that has been traditionally filled by women doesn’t make me a mom. I’m still a dad. And my wife is still a mom. My friend that I met at the National At Home Dad Network annual convention last October, Mike Andrews, Jr., blogger at Geek Daddio of 4, put into words very nicely what I wanted to say. Check out his full blog entry, Mother’s Day: A day for moms. Not dads. Here’s a quote from that piece. We handle every aspect of the house while our amazing wives do what needs to be done to ensure there is food in our mouths and clothes on our backs. But I ask this one simple question, Since when does Mother’s Day mean Homemakers Day? To me, it seems that by giving an at home dad a Mother’s Day gift you are just slapping both, moms and dads, in the face. You are saying, “Dads, you are not man enough and working moms you are not womanly enough because you don’t stay at home.” And that is just wrong. Moms deserve Mother’s Day. It is their day to relax and forget about their problems while the kids serve them. It is a day to honor our mothers and just our mothers. At home dads have their own day, would you give a working mom a Father’s Day card because she is doing a mans job? In essence, I’m asking you to help end the tired and worn out stereotyping of us SAHDs. It’s 2014. Not 1950. Mr. Mom is dead. Besides, this holiday is all about celebrating and honoring mothers. Happy Mother’s Day! I agree with you, it is not homemakers day. I think honestly people don’t know how annoying they are being sometimes. I grew up in Arkansas and people tease me about it. When the same people tell the same jokes over and over and just stare at you waiting for you to laugh, I kind of just want to say “really do you think you are cleaver?” With that said I have realized people like that are not hateful but just not socially appropriate and can’t pick up on other peoples cues. In a way I feel sorry for them because more people than you are having negative thoughts about them, its a way of life for them. I tell myself, never judge yourself by someone elses perception of you! I agree that most people are not hateful but many are either ignorant or clueless when it comes to polite social interactions. I don’t think negative thoughts about them as much as I find their attempts at humor to be lame and worn-out. I have a pretty wacky sense of humor and don’t really get worked up about comments people make. I don’t stat at home with my kids to get the approval or positive comments from others. 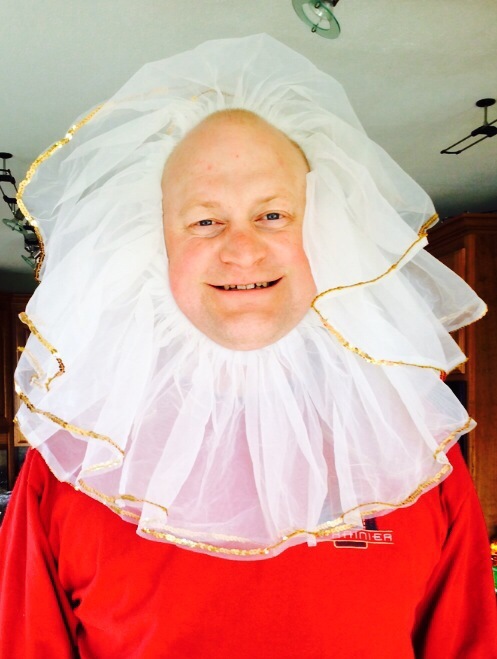 The picture is a silly moment when my three year old asked me to try on a tutu that she found in the dress-up box. That was the only way it fit me.